One of the summer�s most eagerly awaited films is Valerian and the City of a Thousand Planets, director Luc Besson�s epic adaptation of the internationally acclaimed sci-fi adventure comics that have thrilled readers since 1967. 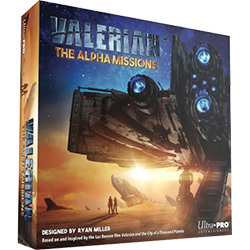 Retailers can appeal to fans of the new film and gamers in search of a galaxy-sized challenge with Ultra-Pro International�s Valerian: The Alpha Missions Board Game. In the cooperative game based on the film, players have been tasked with completing a series of objectives within a contested zone of Alpha. Each player team must explore the sector, searching for targets while battling or evading the enemies that are trying to capture them. Players complete the objectives and get to the extract site to win. The game comes with 50 map tiles and hundreds of cards, ensuring that players will never play the same game twice. Orders for the game are now due. The game is scheduled to ship in August. Order Valerian: The Alpha Missions Board Game (UPE10205) now!